Feeding your garden organic, powerful nutrients is the key to productivity! One of the keys to a healthy, productive garden is to feed your plants and garden soil powerful, organic nutrients on a regular basis. Over the next few weeks, I’ll be sharing all about “Feeding Your Garden”, in a series of blog posts and YouTube videos. This series is will be about four of my favorite, tested, go to products that I use to feed my garden: worm castings, worm tea, my favorite organic fertilizer, and, of course, compost. These products help my garden be healthy, productive and grow lots of food for my family to eat and share with others. We all know how amazing worms are for our gardens. Earthworm castings and earthworm tea (covered in the next post) are produced by worms and are very beneficial for the long term plant and soil health of our gardens. Earthworm castings are organic, and are a powerful soil enhancement. 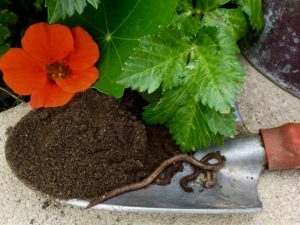 In this post, we’re going to talk about what worm castings are, why they are beneficial to our gardens, and how to use them. Why are Worm Castings Beneficial for Our Gardens? Worm castings supply so much more than just the nitrogen, phosphorus and potassium (NPK) that you see on bags of garden fertilizer. They also supply elements, trace minerals and natural growth hormones that are critical to optimal plant growth. In addition, worm castings are high in humic acid. Humic acid frees up nutrients in the soil, making these nutrients readily available to your garden veggies. This makes worm castings more powerful than animal manures and synthetic fertilizers – which must be broken down in the soil before the plants can absorb the nutrients. Beneficial bacteria and microbes are microscopic organisms that are added by the worm in it’s digestive process and are very active in worm castings. The microbes and beneficial bacteria help create a healthy, living soil. They live around the roots of the plant, protecting them – making them healthy and strong – and provide the perfect atmosphere for vigorous plant growth. 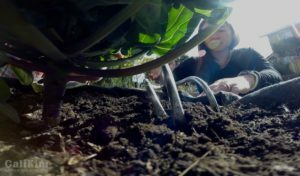 The army of good microbes in the worm castings protect the roots of your plants. Healthy plants are able to defend themselves against pests and disease, while weak plants emit a wavelength that attracts pests and disease. Over the years, I’ve made my own castings with a DIY worm bin and purchased bags of castings at a local garden center. However, for several months now, I have been using VermisTerra organic earthworm castings regularly in my garden. They are quick and simple to use, a little goes a LONG way, and the results I am seeing are pretty impressive! VermisTerra is a Southern California family owned business. Because they are located nearby, I had the opportunity to meet the family personally. As I got to know them, not only was I deeply touched by their family’s story, but realized that they take great care to make sure their worm castings and worm tea are of the highest quality. Their expert, Mindy, paid several visits to my garden. During her visits, she shared with me that her dad, grandfather and uncle ran a veggie farm for 20 years. They used conventional methods with chemical fertilizers. When Mindy was in college, her dad and grandfather contracted cancer, and although they fought hard to overcome the disease, they didn’t make it. After their deaths, her uncle switched to farming with organic methods, and then decided to start a worm farm in 2002. Because of their personal tradgedy, Mindy and her uncle became passionate about teaching people how to grow their own food organically. Though their worm farm, they began producing high quality worm castings and worm tea that are safe for people to use on their gardens. What Makes VermisTerra Worm Castings Special? VermisTerra worms are fed green waste – using no animal manure or fillers like newspaper or cardboard. The castings are then aged 7-10 years, and screened, making them a super fine texture, and easy for plants to absorb. Many people think the fresher worm castings are, the better. Quite the opposite! When worm castings are fresh, they contain undigested material that is still decomposing, and the plants are not able to absorb the nutrients in the castings. VermisTerra is certified organic by the USDA, and the California CDFA. They test each batch of castings (something very unusual in the industry) to make sure they are of the highest quality, and contain no heavy metals or toxins. VermisTerra’s worm castings truly are “black gold” for your garden! Worm castings are very easy to incorporate into your regular garden feeding routine. The key is: keep it simple, and little goes a very long way. Worm castings help with germination when starting seeds. 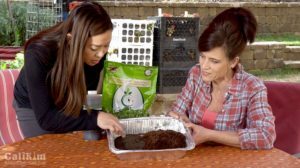 Worm castings are especially effective for starting seeds indoors or out, because they protect the roots of the seedings, help prevent damping off disease, and keep fungus gnats under control. -Add worm castings to your bagged potting soil, 2 parts potting soil to 1 part worm castings. -Place your potting mix/soiless mix in small seed cells, a cup, or other small container. Worm castings are timed release, so work well in container gardening. Worm castings are effective for containers plants because they are time released (thus only need to be used once a season) and don’t burn the plants. Using worm castings in your garden beds will increase the survival rate of your transplants, creates aeration, and makes your soil healthier. Soon you’ll see more worms in your garden beds – they will leave their own castings. Over time, you will need to add less and less castings as your soil becomes a healthy, living environment for your plants. -Use 1 pound per square foot when amending your entire garden bed. Watch the video on my YouTube channel below “How to Use Worm Castings in Your Garden”, to see exactly how to use them, and to enter a drawing for free worm castings. Watch today – entry deadline is February 15th, 2017! To purchase VermisTerra worm castings or tea, click on the “Partner’s Store” tab at the top of this page, use promo code “calikim” for 10% off. Receive free shipping for any orders over $55. For a limited time, they are offering a free quart of worm tea (a $26.99 value) with any purchase, so you can try it out for yourself! I’m seeing fantastic results with using VermisTerra’s‘s worm castings in my seedlings, container plants and garden beds. My winter garden this year has been very healthy and one of the most productive I’ve ever had! Have you ever used worm castings in your garden? Comment below and let me know! Thanks to VermisTerra for providing worm castings to test in my garden and for sponsoring this blog post. Some of the links in this post are affiliate links – I make a small commission when you order through these links and its helps me keep the garden content coming! I did not know that aged worm castings or so much more plant effective than fresh earthworm droppings. Thanks for the video/blog. Thanks! Learned how beneficial worm castings are for my organic garden. So easy to use which is good for an intermediate gardener. Thank you for all your video’s they have been inspiring to me. Just ordered my first bag of worm castings. They are a very powerful nutrient, especially when used along with worm tea. I am so glad you are using them now on your garden! Did you see that VermisTerra is now offering free shipping for orders over $55? They really are committed to helping people learn how to garden safely and organically. Let me know how it goes for you! the aged castings are fully broken down making the nutrients are immediately available to the plants. It’s kind of like adding unfinished compost to your garden beds. Still adds fantastic organic material, but it has to break down completely to be fully utilized. Let me know if you give Vermisterra’s worm castings a try – my garden is loving it! Is it still cold there in the UK, Linda? I hope you and your family are making it through the winter – I know you’ve had some rough spots this year. Take the time you need to take care of yourself and head out to your greenhouse when you can to fit in some garden therapy. I find it does help me with stress. Thanks for taking the time to stop by the blog! I didn’t know that there was a difference between fresh and aged castings. Pretty interesting, isn’t it? The plants can uptake the nutrients right away from these aged castings, and the microbes and beneficial bacteria can really go to town protecting the roots of the plants. Thanks for stopping by to share what you have learned! Very informative. I was literally just up on my rooftop garden applying aged worm compost and wondering if the rich bacterial life was absent. But I’m also wondering why my garden doesn’t measure up…so it is possible that I am using too much of a good thing. I never knew that worm castings and worm tea contained properties that can protect my plants from diseases. I also had never heard of the benefits of the castings being aged. I’m very excited to try these products in my garden and in my seed starting trays. BTW that is my first year using MIGarden seeds, thanks to you CaliKim. I’m looking forward to a wonderful growing season. I grow mostly in raised beds. I live in a gated community with just 1/3 acre lot. My neighbor can’t believe I grow most of my own vegetables for canning, freezing and eating in such a small space. Used container last year for potatoes and although the plants were very healthy I only got about a dozen sm potatoes from the 12 plants from seed potatoes I bought. Any suggestions for a better yield. I used organic potting soil and mixed in compost. Thanks for this video, now I have something new to try. I love the fact that my plants will have more defence from disease. How amazing that you are growing most of your own produce – isn’t it rewarding? 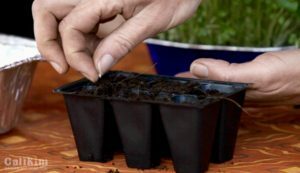 MIgardener’s seeds are fantastic – will be starting the spring garden series with his $10 Garden Seed Kit in the next few weeks, I hope you will follow along. As far as potatoes, we don’t eat a lot of potatoes, and I have actually only grown them once. 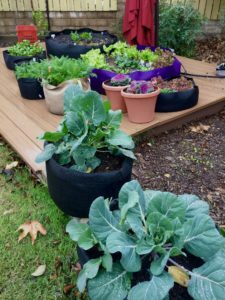 They grow best here in So Cal in the winter – what time of year do you grow them> Let me know if you try worm castings and how it goes! AND SHAKE AND THEN PLANT…HELPS DETER BUGS, ESP…..ALSO ADD ROCK DUST, A COUPLE OF HANDFULS….LIKE AZOMITE…. Thanks for sharing Mindy’s story. Happy to hear Cost-co Lemons are feed with Vermisterras castings! Didn’t realize just how healthy and useful worm castings really are. Also excited to try coco coir and castings to start some seeds this spring. Thanks for all the energy you put into your videos/ blog. I’ve been learning so much and am so inspired to keep my beginning skills in action growing food for my family and friends! Pretty cool to know that when you buy organic worm castings at Costco, they are fed with VermisTerra’s black gold! I hope you get to try them with your seed starting, please keep me posted. I appreciate your kind words – I enjoy sharing what I am passionate about with others. It sounds like you do too – awesome that you can share your home grown food to those you love. Happy Gardening! I didn’t know that worms know to only eat dead matter versus live. That was new information to me too – I learned so much from Mindy. Pretty cool how they really are workhorses in our gardens! Enjoy your spring garden! All of this was pretty much new news for me. I didn’t know about worm castings at all. Thank you so much for all the info. I am really looking forward to gardening this spring! Thanks for stopping by my blog and for watching me on YT also! Pretty cool how amazing worm castings and tea are in our gardens! Perfect for starting seedings, or for using right in the ground. I hope you get to try them as you start your seeds. Happy spring to you too! Always fun to learn something new – worm castings are such an amazing way to feed our gardens. Hope you get to try them. Thanks for stopping by my blog – enjoy your spring gardening! I didn’t know that aged castings is better than fresh. I need to get more worms in my garden and this seems like a really great way to do that. Thanks for the video. I just love how much I learn from you Kim. Thanks for all you do. Blessings. 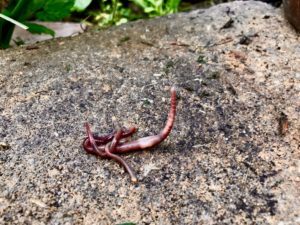 Glad you are learning more about worm castings – and more worms are always a plus! Think of it like putting partially finished compost in your soil – before your plants can fully utilize it, the compost has to break down more. This is why VermisTerra’s aged castings can be absorbed by the plant right away and help it get off to a great start. Thanks so much for stopping by and blessings to you too! When do I put castings or tea in the soil? Which season? CaliKim thank you so much for your healthy, organic, garden tips! I built my first strawberry tower with root strawberries and looking forward to seeing how they progress with the worm castings. I started my garden and placed some worm castings around each plant, ( the castings came in after I had already planted). What happens if it rains? Should it be reapplied? Glad you’re enjoying the blog!! Thanks for your support! You definitely put a brand new spin on a subject that has been discussed for many years. I am getting my garden ready for the winter. I will be pulling up plants and adding amendments and mulch. I have a lot of worm castings that I have not used( from my own worms) Would this be a good time to remove the worms and use the castings on the beds under the leaf mulch for the winter? Great plan- yes this is a super time to take the worms out, put that black gold in your beds and cover with at least 2” of mulch-you might even have enough worms to split up and start two containers of castings!! Thanks for stopping by! !